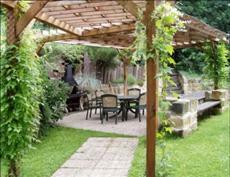 The Filip guest house is situated near the Prague Castle and a quiet area near Petrin. There is a fine view of the Prague panorama from the guest house, and yet it is only 10 minutes by a MHD bus from the Prague Castle and circa 15 minutes from the Prague centre. It is surrounded with a large spectacular garden, which can be used as a place of rest or where you can have a BBQ with your friends. Parking is right in front of the boarding house in an enclosed parking site (the Filip boarding house owns 7 of the parking places).